GRAFENWOEHR, Germany – What’s pint-sized, wears purple and is tough enough to meet the challenges of a military upbringing? Military brats! 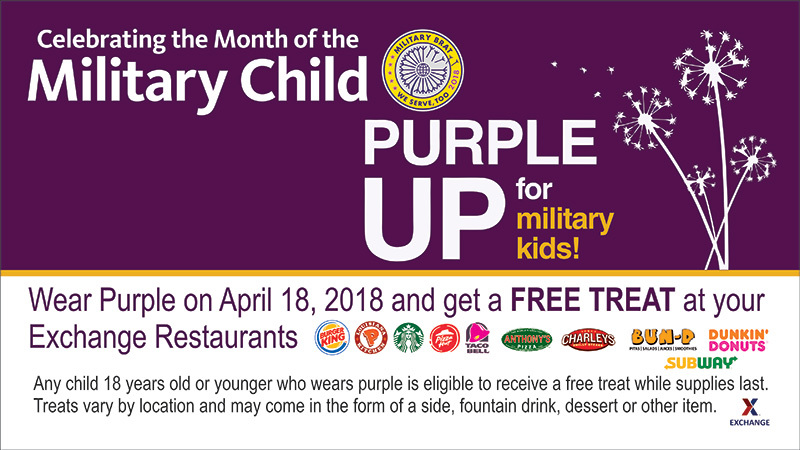 On April 18, the Army & Air Force Exchange Service at Tower Barracks, Rose Barracks and Hohenfels will celebrate Purple Up Day, a worldwide recognition of the strength and sacrifice of military children, by offering free treats to any child who wears purple to participating Exchange restaurants. To learn about other Month of the Military Child events coming to the Grafenwoehr Exchange, call 09641-9363221. For information on the Exchange’s worldwide Month of the Military Child initiatives, including sweepstakes and special offers, visit ShopMyExchange.com/MOMC.